You sleep with your sawed-off shotgun across your lap and your fingers wrapped loosely around the handle of your machete (because remember: blades don’t need reloading). You’re 200 days into the zombie apocalypse and you need a ride. What do you choose? I’m just kidding about the choosing part—choice is merely an illusion—because there’s only one answer to this question and it’s this battle-car Bentley Continental GT. 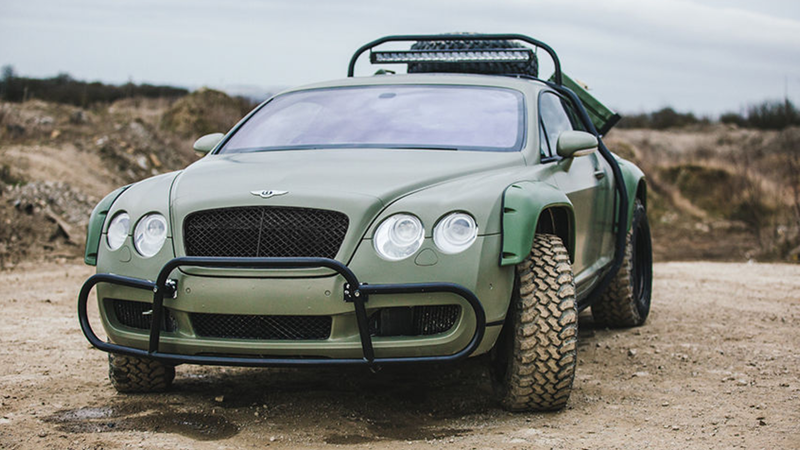 Yes, online marketplaces like eBay and the whole money structure are a thing of the distant and rubble-filled past, but this is the only way you can get the battle Bentley. Once upon a time, when civilization still concerned itself for leisurely activities like television, it built the Bentley as a bespoke project for the National Geographic series Supercar Megabuild, according to the eBay listing. It’s had £25,000 ($32,424) worth of upgrades and is fully drivable on the road. Once upon a time, the Bentley was silver. Now it’s khaki green, perfect for blending in with the wasted landscape that now scars the face of the planet. It has a 6.0-liter W12 with loads of torque—good for towing pieces of scrap and other supplies you come across back to your bunker. Four-wheel-drive is there to help you through roadways covered in gravel and blood. Air-conditioning to cool you off after you’ve run for you life from the undead. A keyless push-start button is handy for when you have a hoard of the hungry bastards pounding on the windows and you don’t have time to fumble in your pockets for the keys. It also has eight Quantum Racing adjustable shocks, two per corner for when the roads just aren’t an option anymore. A steel external roll-cage for extra stiffness. Bash plates for protecting the underbody: there’s no telling what you’ll be driving over. Spare wheel and gas cans mounted on the back for emergency situations, which is to say, will be all of them. Plus, automatic folding mirrors! So they won’t get knocked off if you park somewhere. These guys really thought of everything. The current bid to beat right now is $19,843.67. Go! Go! Go!